UNMC medical students Max Lydiatt (standing on right) and Elsa Parr (to the right of Lydiatt) teach Girls Inc. students in the teen cooking class about healthy eating using new food models purchased with money from a Nebraska Medicine Guild grant. The College of Medicine is looking to increase nutrition education among students in an engaging way. Some UNMC medical students recently took their health education skills to Girls Inc. Omaha, a local organization that provides mentoring and programming for school age girls. 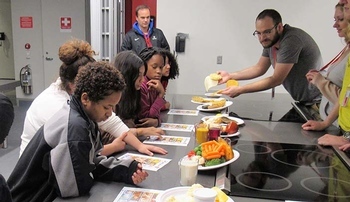 The UNMC students, either as part of a rotation or as volunteers, taught Girls Inc. students in the teen cooking class about healthy eating using new food models. The models were purchased with a Nebraska Medicine Guild grant awarded to Steven Wengel, M.D., assistant vice chancellor for campus wellness for UNO and UNMC, and interim geriatric psychiatry division director. To teach about healthy eating, students used the food models and interactive My Plate model. They also led a class that looked at ways to decrease the amount of calories consumed through drinks. Hannah Stewart, volunteer coordinator for Girls Inc., said collaboration with medical students allows teens to see medical students as peers, as well as know that a future in medicine is not so far out of reach. "The UNMC students took part in the healthy cooking programming, which also gave the Girls Inc. students time to ask questions about medical school, hobbies, and life after school," she said. Dr. Wengel said he is pleased with the results of the pilot project. "Not only were the young women at Girls Inc. given some new and very practical skills to improve their own health, but as an unintended side benefit, our outstanding UNMC student volunteers also got a great deal of satisfaction, and dare I say joy, out of the experience," Dr. Wengel said. "Several wellness needs were met with this project. My hat is off to Dr. Susan Evans for her creativity and drive to improve the health of our community in this unique way." Susan Evans, M.D. assistant professor of family medicine, who works on the project with the medical students, said she hope that other medical students will participate in the future. "It's a great opportunity for medical students to teach young people about healthy eating. Girls Inc. will be a great opportunity for that," Dr. Evans said. Medical student Amy Dreesen said her experience at Girls Inc. was a great opportunity to explore Girls Inc. as a resource for young females in the community. "The young women I had the privilege of interacting with were very welcoming and had significant goals for themselves," Dreesen said. We were able to participate in a cooking class with them, and the staff member teaching the cooking classes used it as an educational opportunity by showing them how cooking changes the flavor of vegetables that were added to the pizzas. "Overall, it was a phenomenal experience, and I hope more medical students have the opportunity to volunteer there in the future."